The Global Volcanism Program has no activity reports for Buldir. The Global Volcanism Program has no Weekly Reports available for Buldir. The Global Volcanism Program has no Bulletin Reports available for Buldir. The westernmost volcanic center of the 2500-km-long Aleutian arc, the island includes the older Buldir volcano in the center and the younger East Cape volcano to the NE. The high point of the island is a tuff cone that tops the older center. A plug dome forms the summit of East Cape volcano, which has two principal peaks. The youngest volcanic feature on the isolated, 4.2 x 7.2 km island is a lava dome on the SE flank of East Cape volcano. The dome was considered by Coats (1951) to be of Pleistocene age based on morphologic considerations. Smith and Shaw (1975) suggested that the volcano may have been active within the last two thousand years, however, Holocene activity is uncertain, and the volcano may have ceased activity during the Pleistocene (Motyka et al. 1993, Nye et al. 1998). The flora is less varied than on neighboring islands, suggesting that Buldir is relatively young. Coats R R, 1951. Geology of Buldir Island, Aleutian Islands, Alaska. U S Geol Surv Bull, 989-A: 1-26. Nye C J, McGimsey G, Power J, 1998. Volcanoes of Alaska. Alaska Div Geol Geophys Surv, Inf Circ, 38. The Global Volcanism Program is not aware of any Holocene eruptions from Buldir. If this volcano has had large eruptions (VEI >= 4) prior to 10,000 years ago, information might be found on the Buldir page in the LaMEVE (Large Magnitude Explosive Volcanic Eruptions) database, a part of the Volcano Global Risk Identification and Analysis Project (VOGRIPA). There is no Deformation History data available for Buldir. There is no Emissions History data available for Buldir. Winter snows drape Buldir, the westernmost Quaternary volcanic center of the 2500-km-long Aleutian arc. 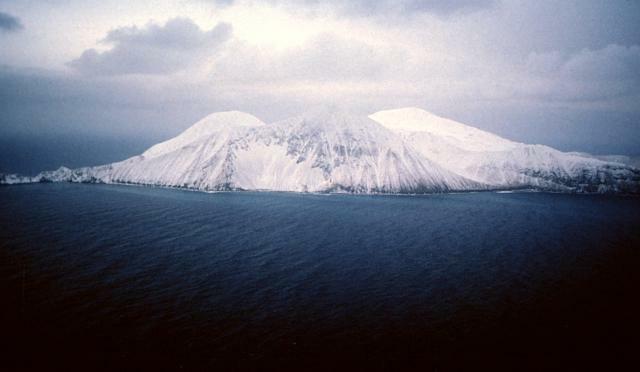 The older Buldir volcano lies at the center of the island and the younger East Cape volcano forms the NE portion. The age of the most recent eruptions is not known precisely, but has been estimated to be late Pleistocene or Holocene. Photo by Fred Deines, 1987 (U.S. Fish & Wildlife Service). The following 15 samples associated with this volcano can be found in the Smithsonian's NMNH Department of Mineral Sciences collections, and may be availble for research (contact the Rock and Ore Collections Manager). Catalog number links will open a window with more information. Large Eruptions of Buldir Information about large Quaternary eruptions (VEI >= 4) is cataloged in the Large Magnitude Explosive Volcanic Eruptions (LaMEVE) database of the Volcano Global Risk Identification and Analysis Project (VOGRIPA).